This surveillance console at the Port of Los Angeles shows its versatility by being able to have everything within arm’s length. As with most security applications, seeing the visual cues from multiple cameras and reacting to them is the most important thing to the security officer. General typing functions are essential in order to immediately react to situations. Note that there are a number of low-profile rack mount turrets for mounting video switches and plenty of room for joysticks, phones and other peripheral devices. 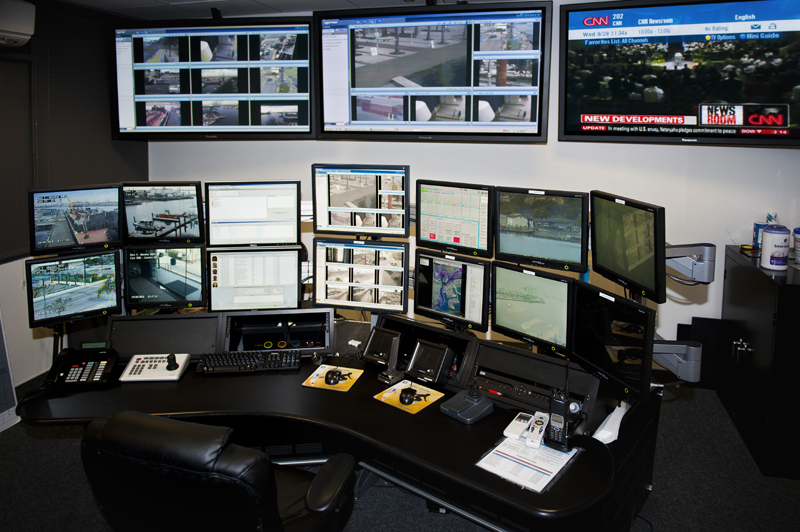 Our surveillance consoles come in many sizes and shapes. They are custom manufactured to meet each customers needs. As with our dispatch consoles, we have a myriad of options and accessories that turn the standard model into yours. 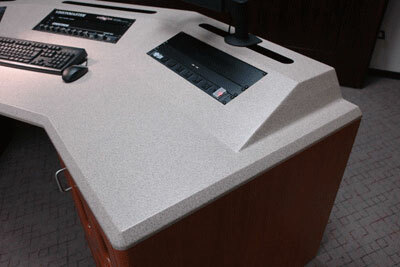 This custom console integrates low-profile compact 4 RU equipment turrets seamlessly as part of the worksurface. We include continuous grommets on top of the turrets for mounting monitor arms, task lights and other peripherals. Slatwalls are also available but really not needed in this design. 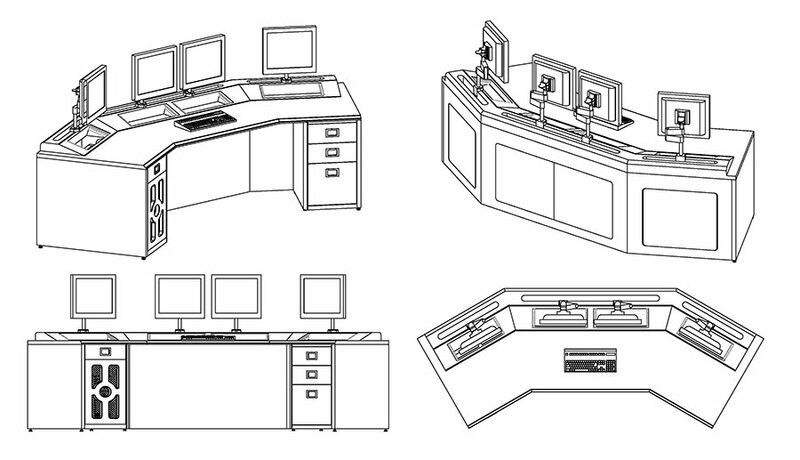 All Americon workstations include segregated cable management, adjustable leveling glides, power and data distribution and much much more. The material we use is many times more resistant to impact than the standard plastic laminates used by our competitors. Our free-formed worksurfaces have detailed comfort edges that eliminate that unsightly bumper molding you've become accustom to from our competitors.